The real estate scenario of Chennai is thriving at the moment. With the city’s rapid expansion, areas in West Chennai have been gaining massive popularity among home buyers. Nolambur, in particular, has been attracting a lot of buyers on account of its impeccable location, affordable housing options and safe neighbourhood. If you’ve been dreaming of finding the perfect home for you and your family in this burgeoning locality, Casagrand Crescendo is here to make that dream come true. Read on for five reasons why Casagrand Crescendo should be your next home. There is no doubt that properties developed in the fast-developing suburban areas of Chennai offer the highest appreciation rates. Owing to its close proximity to the city, the demand for vacant apartments in Nolambur is quite high. Even if you choose to bid the apartment for rent, you will be surprised at the rentals it can generate. Over the years, the appreciation value of the property will only see an upward trend, making this is the right time to purchase an apartment at Crescendo. So what makes Casagrand Crescendo one of the most viable residential options in Nolambur? The answer to that would be its amazing social infrastructure. There is an abundance of reputed schools, colleges, prominent supermarkets, food joints and hospitals within a 10-minute radius. Few of the reputed educational institutes include The Schram Academy, V Kids Preschool, Dawn School and MMM College of Nursing. The renowned hospitals dotting the area include New Life Hospitals and Holistic Hospital, to name a few. The top restaurants in the area are Eat Point, Pepper Moon and Krishna’s Dosa Kadai, offering you the best of global cuisines. With the Nolambur Bus Stand and Ambattur Railway Station just 10 minutes away from the property, the daily commuters can travel hassle-free. Since this neighbourhood is a stone’s throw away from the happening locality of Mogappair, you can enjoy uninterrupted connectivity to all major hubs of the city through the Padi Flyover. Your daily commute to the office cannot get easier and better than this. When it comes to delivering a beautiful home experience, Casagrand has undoubtedly been the best in the market. Their efficiently planned internal spaces for optimum utilisation are something you would be most impressed with. It is an amalgamation of style and comfort. The amenities and facilities offered in a project are one of the ten things to check before you buy a property and Crescendo offers exactly that! Feel like taking a dip in the water on a hot day? There is an in-house swimming pool at your disposal. Not to mention the outdoor barbeque area where you could host an office party. The property is well equipped with a plethora of fitness and health amenities to choose from like indoor squash court, yoga room, aerobic room and an open spa pool. Be assured, the facilities provided are everything you could dream of and more. Casagrand Crescendo stands majestically as the tallest structure in the area with 21 storeyed towers. This property is nothing less of a masterpiece. It’s not only a treat for the eyes but also functional in improving the quality of human habitation in general. The meticulous orientation of the property ensures good ventilation at all times and an undisturbed, mesmerising view of the city. Developed by highly-skilled architects, this building is an embodiment of superior aesthetics. In an effort to be in harmony with the environment, the property is still intact of 77% lush greenery. It’s guaranteed that you will instantly fall in love with it at first sight. 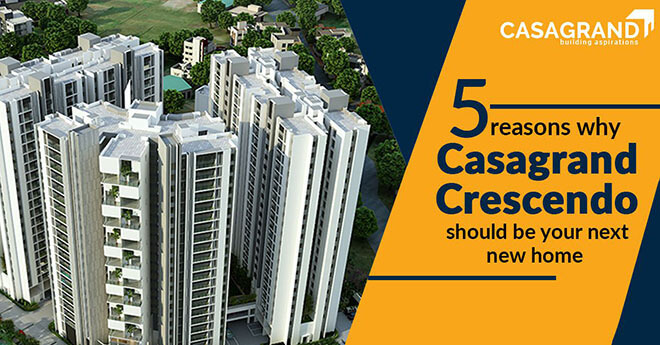 These outstanding reasons are proof that Casagrand Crescendo is the perfect home for those who crave an urban lifestyle amidst the peace and quiet of the suburbs, and is the best option for NRI investors. Your quintessential home in Casagrand Crescendo will offer you top-notch living and high returns – the best of both worlds. Head out to Casagrand today and find your dream home.